So far on this trip we had spent time on the beach, on boats and ferries, kayaking, and sightseeing, and now we wanted to do a bit of hiking in Bulgaria, a country which, with its many national parks, provided the perfect opportunity, but as you can imagine, travelling by motorbike does not allow us to carry much gear, so we were a bit limited in our ambitions. 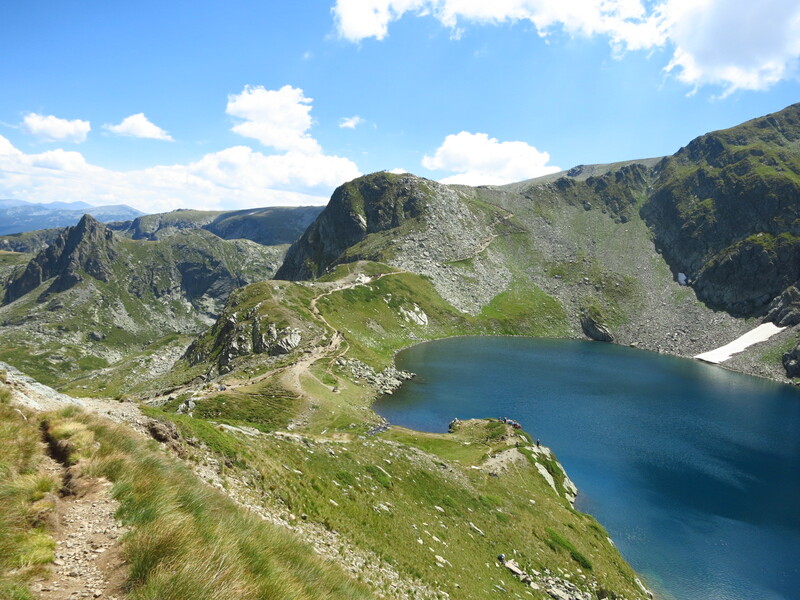 After some research we found a very popular route – the trek of the seven lakes in Rila natural park. The route starts from a ski lift some kilometres past the village of Panichishte, part of a ski station that works as a bike park in the summer. 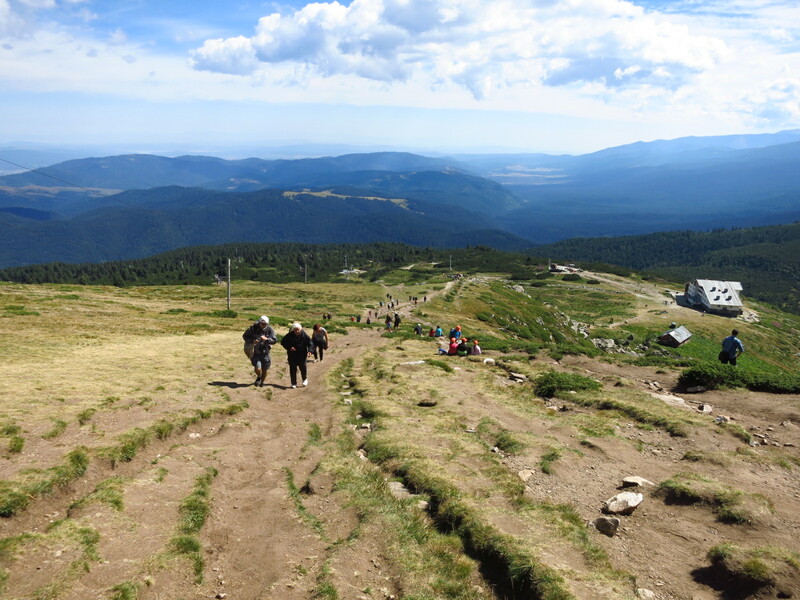 You can either take the chair lift to Rilski Ezera Hut, where the trek begins, or walk up from the car park, which adds between one and a half and two hours to the five to six hours it takes to visit all seven lakes. It was clear that this was a very popular site when we started seeing cars parked on the side of the road a good while before we reached the car park, for which you had to pay. 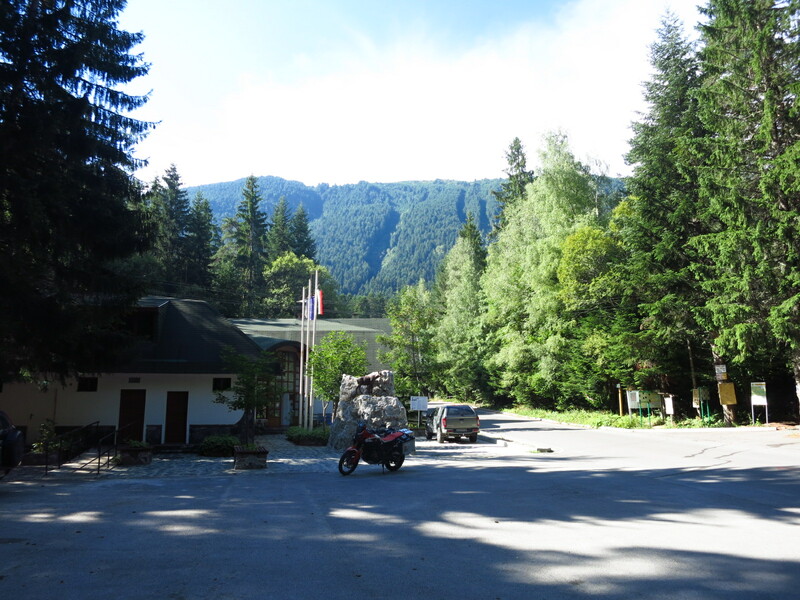 As we approached the guy charging the cars he said ‘moto free’ and waved us past, and when we got to the end of the car park, the man who was at the chair lift turnstile signalled to us to park the bike just past the lift building, where the staff cars and the snow cats were. Once again, it’s a pleasure to travel by bike. 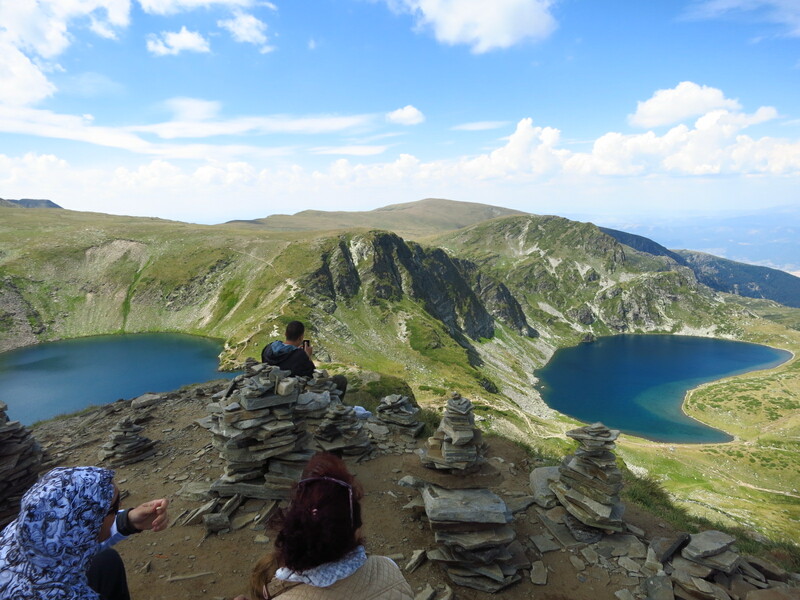 The chair lift is worth taking not only for the time it saves, allowing you to spend more time on the lakes trek, but also for the views it offers over the valley as it climbs higher and higher. Once we reached the hut we understood why we had read that it was impossible to get lost on this trek – not only was there a long line of people slowly creeping up the mountain, but the path itself was well trodden and impossible to miss. 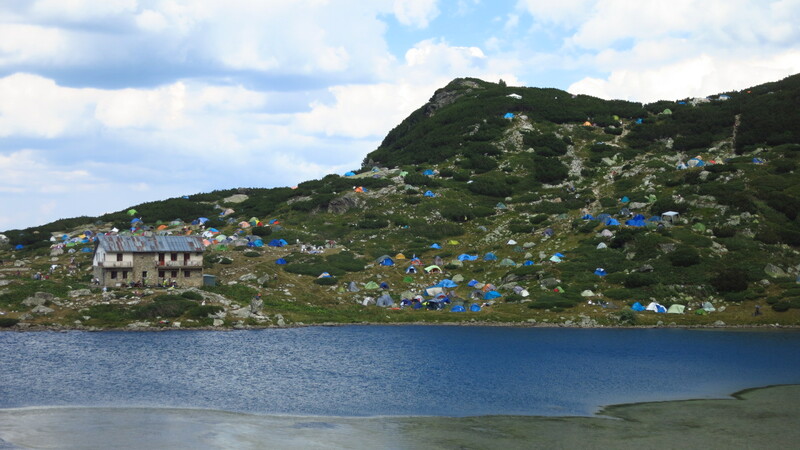 We started the trek counter clockwise, as most people did, walking on a steep path with a drop to the left from where we soon had a view of the two last lakes and another hut, this one bigger and surrounded by hundreds of tents. The path levelled off on a grass plain where we saw the first lake, called Babreka (the kidney), and also a big group of people standing in a circle engaged in some kind of activity that I could not tell – it might have been yoga, it might have been some sort of ritual, but to me it mostly looked as if they were trying to strangle themselves. 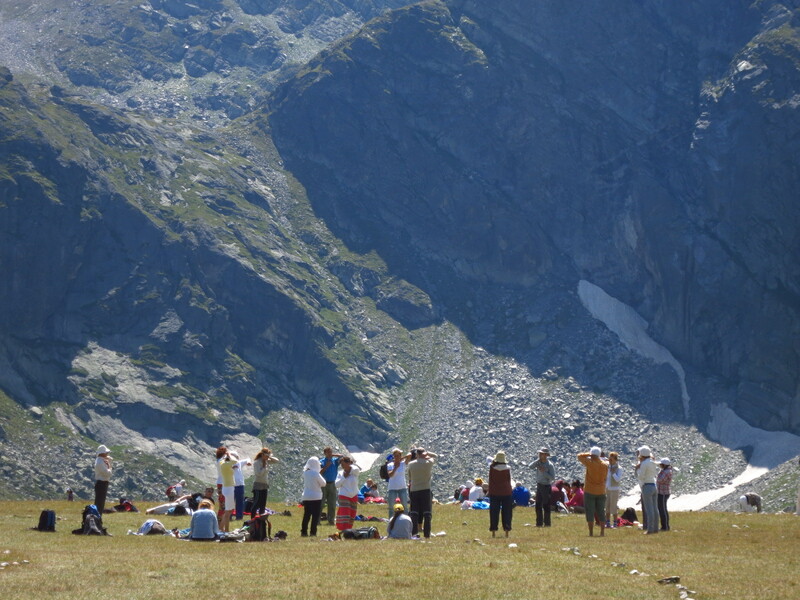 That, and the fact that they were standing in he middle of huge concentric circles marked on the ground reminded me that I has seen a book for sale in a road café a few kilometres before the chair lift titled ‘The Esoteric Guide to the Sacred Rila Lakes’. After that I started seeing that among the many tourists walking around there were a fair number of people rather peculiarly dressed, as if they had just come back from a year of meditation in some remote monastery or had teleported across time and space from Woodstock. Just past this curious sight the path started climbing steeply until we found the second lake, Okoto (the eye), called like that because it forms a perfect oval. There we should have turned left and continue climbing to a high rock outcrop on the top of which we could see even more people, their silhouettes cut out against the sky, but I saw another path that went right and probably led to a peak we could see not far away. 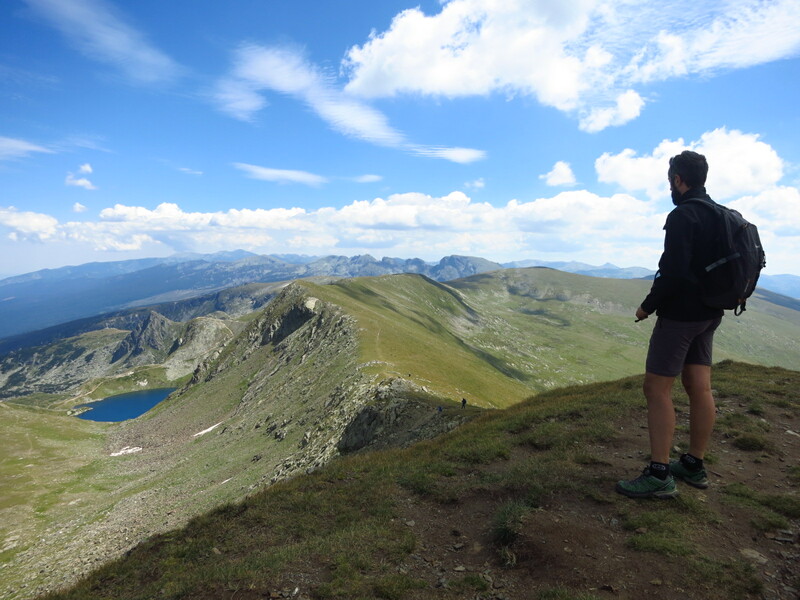 We had reached the second highest lake sooner than expected, the day was glorious and I thought ‘why not?’ and we started the climb. An hour later and 300m higher, we were standing on top of a mountain with 360 degree views over the whole park. My altimeter read 2714 metres, and later I found that we were on a peak called Rilec. From there we had the privilege to see an eighth lake on the other side of the mountain that most people doing the route don’t see. 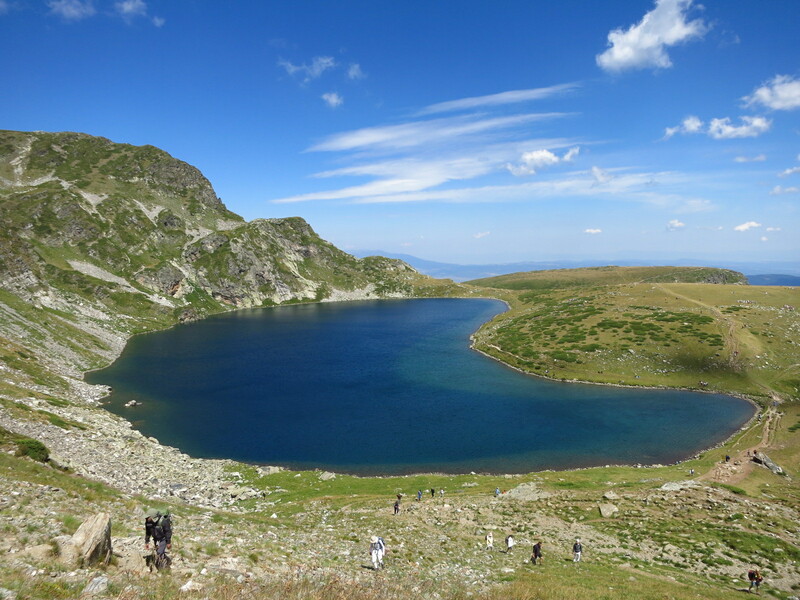 We went down to lake Okoto again and climbed the outcrop, from where we saw the third and highest lake in the trek – lake Salzata (the tear), and had a view of all seven lakes at once. We had lunch there, contemplating the views and chatting to a Bulgarian family that lived in Pamplona and had come back to their country on holidays. 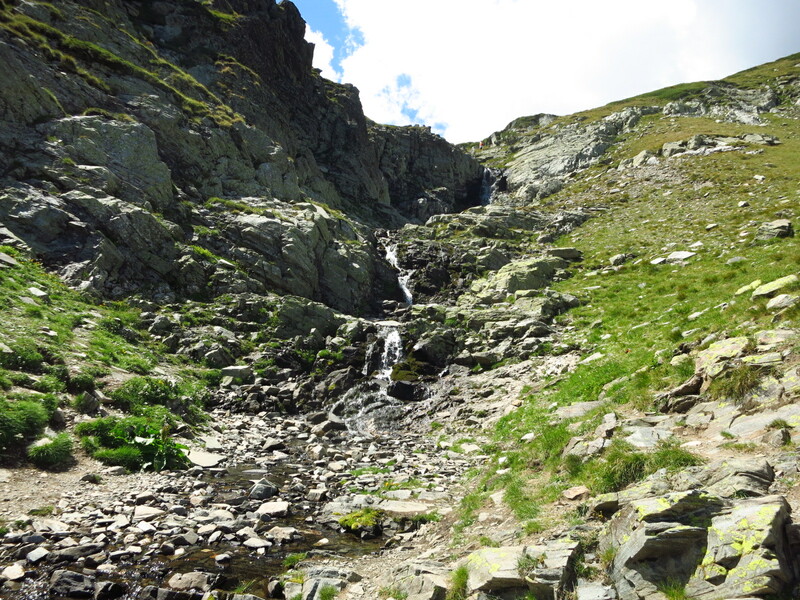 After climbing down to the point where the waterfall coming from Okoto met the stream coming from Babreka and turned right to go back to the chair lift via the remaining four lakes – Bliznaka (the twin), Trilistnika (the trefoil), Ribnoto Ezero (the fish lake) and Dolnoto Ezero (the lower lake). 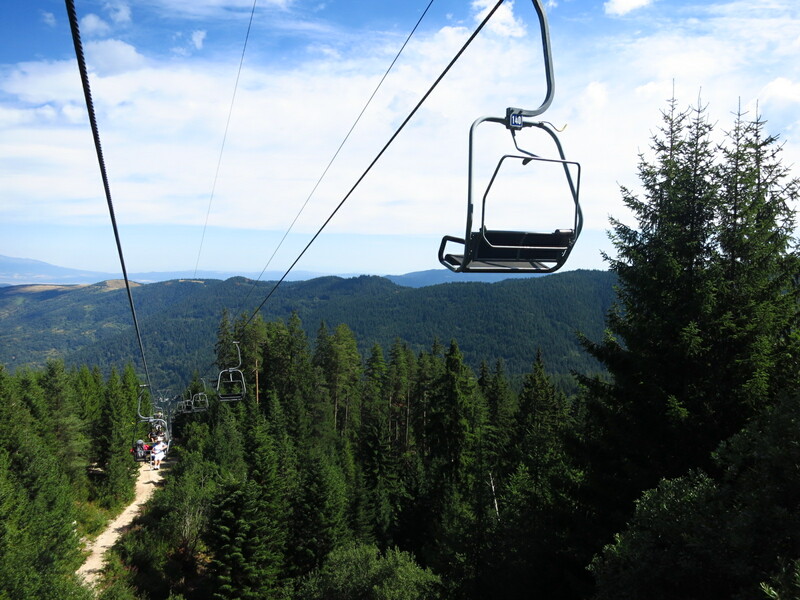 We took the chairlift back to the motorbike, glad to have chosen this option, as it had given us enough time to climb peak Rilec, and started heading back to Blagoevgrad. We took a detour on the way back because we wanted to visit the Rila monastery, which we had heard is the biggest in the country. The problem was that we had not researched where it was exactly, road signs in this part of the world are between few and none and people in small villages don’t speak any English, so after riding up a valley past the town of the same name for a while and not finding it, we decided to turn back and head for the city, as it was getting late and we needed to find an open supermarket to buy some food for the following day. While Nat was doing the shopping I stayed with the motorbike and as I was waiting a small kid came, ogling at the bike. 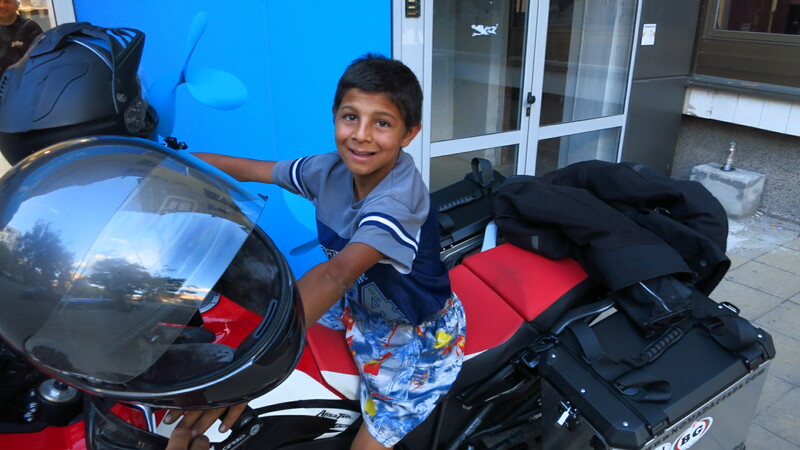 He did not understand a single word I tried to tell him, and I did not understand what he was asking, but the love for motorbikes is a universal language, particularly among kids, and he was delighted when I sat him on it and let him fiddle with the horn and indicators. When Nat came back with the shopping I showed him which button to press to turn the engine on – you should have seen the look on his face when he pressed it and the engine roared to life. It probably made his day, week and even year. I hope things turn out well in life for him and one day he can ride his own bike. 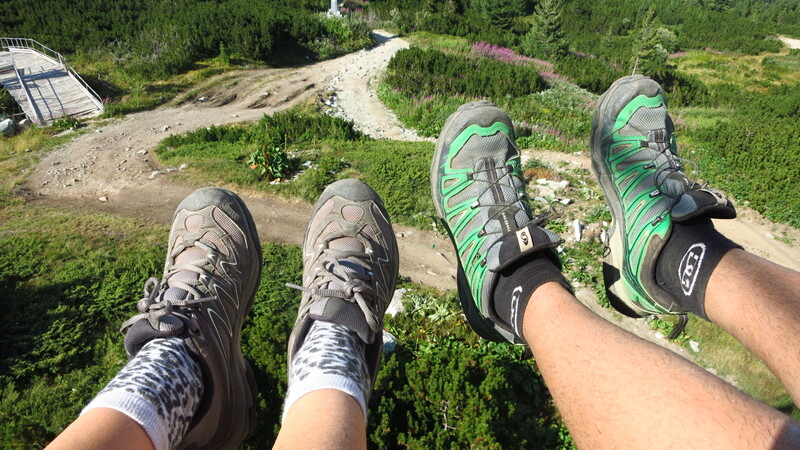 This entry was posted in Balkan Adventure 2016, Travel and tagged Blagoevgrad, Bulgaria, chair lift, Honda CRF 1000L, Panichishte, Rila natural park, Rilec peak, seven lake trek by Kilian. Bookmark the permalink.